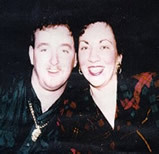 The Government of the Province of Nova Scotia is offering rewards of up to one hundred and fifty thousand dollars ($150,000) for information leading to the arrest and conviction of the person(s) responsible for the deaths of Richard Joseph and Gail Marie STONE MARRIOTT. On November 20, 1998, at 9:41 pm, police responded to a report of a double shooting at 15 Parkmoor Avenue, Halifax. Upon police arrival, Gail Marie STONE was located inside the residence having suffered injuries as a result of being shot. Ms. STONE was transported to the QEII Hospital, however, she died from her injuries four days later. Richard Joseph MARRIOTT, the common law husband of Ms. STONE, who was in a wheelchair, was also located inside the residence, where he suffered from fatal gun shot wounds. Mr. MARRIOTT was seen alive at approximately 9:15 pm this same evening on Dutch Village Road. Mr. MARRIOTT was driving a maroon colored 1996 Dodge Caravan, and it is believed that he arrived home at approximately 9:30 pm. The two victims were found a short time later. Any person with information regarding the person(s) responsible for the deaths of Richard Joseph and Gail Marie STONE MARRIOTT should call the Rewards for Major Unsolved Crimes Program at 1-888-710-9090. The reward is payable in Canadian funds and will be apportioned as deemed just by the Minister of Justice for the Province of Nova Scotia. Employees of law enforcement and correctional agencies are not eligible to collect this reward.